For most parts of the country it's finally spring! Your Catasetinae should be or are just getting started to grow. Most of you along the southern edge of the country have already started watering and fertilizing. 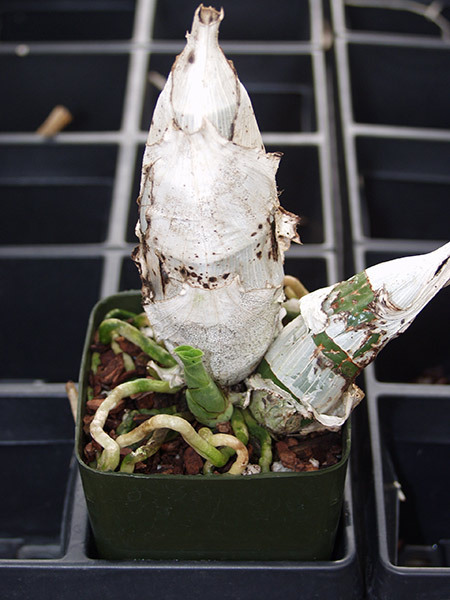 I am hearing reports from many Southern growers that most of the new growths are 6"-12" tall with new roots 3"-6" long. This is the time to start watering! The growers farther north (myself included) may still have a few weeks until the new roots are 3"-6" long. 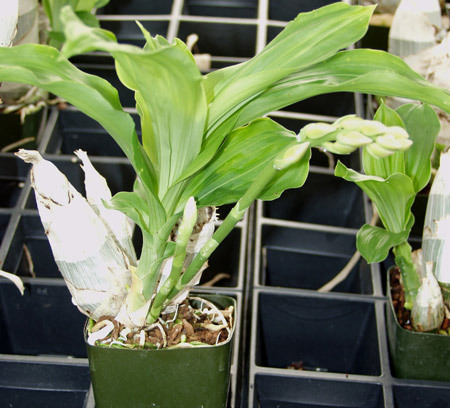 Remember: not all Catasetinae come out of dormancy at the same time, so you may have some plants showing well-developed roots while others will be just starting to root. Begin watering and fertilizing those plants that are ready and hold off on the ones still needing more time; this is a good practice to develop. I start the watering season using ½ tsp fertilizer per gallon of water, and then, as the days get longer and the temperatures warm up in late June and early July, I increase the fertilizer to 1 tsp per gallon through August, before switching back to ½ tsp from September through October. Don't forget that Catasetinae prefer to be re-potted or divided with the onset of new growth just before the new roots start to show. Early in the growing season is when spider mites can get a foot-hold on your plants. Be diligent and check the undersides of the new leaves regularly. If mites are detected, spray immediately. They can quickly get out of control is early action is not taken! Catasetinae like lots of light and air movement. I keep mine under 50% shade with lots of air movement day and night. Ideal temperatures in early spring are 60 degree nights and 75-85 degree days, with humidity between 40% and 60%. The new 2016 Catasetinae offering is really amazing. Never before has there been such a comprehensive list of high-quality species and hybrids available for sale. It has taken many years to collect, select, and develop these breeding lines. The excellence of the breeding stock is without compare, and these plants will set the new standard for flower quality, vigor, and your enjoyment. 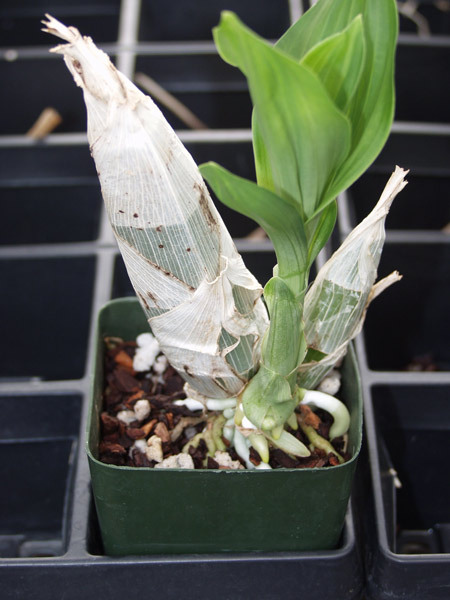 The focus this year has been in 5 areas: Cycnoches, Mini-Catasetums, Species, Mormodias, and Fredclarkearas. I expect to have the new Catasetinae list ready in early June. Start saving your $'s now, the new list is really that good! 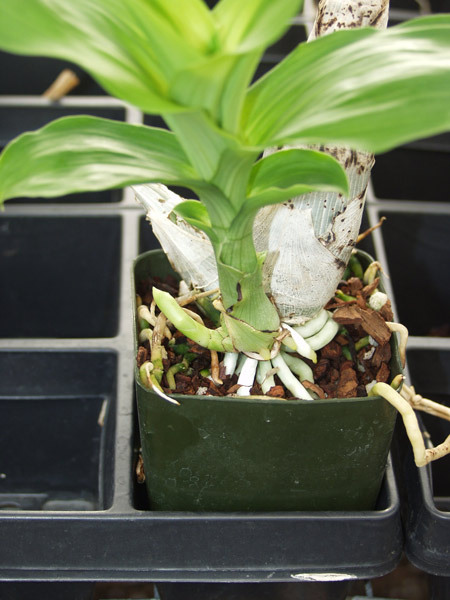 Here are some pictures showing root development and when to start watering and fertilizing. Start watering now, roots 4"- 6"
Fully rooted plant, top growth 10"
I am always available to take your calls and E-mails so please feel free to contact me. Please forward this e-mail to your orchid friends; you don't want them to miss out, do you...? "Your support as customers and friends is truly appreciated"